When it comes to industrial storage containers in Seattle, there’s only one company you need. Haulaway Storage Containers has over fifty years of experience in offering quality storage solutions to our valued customers. Our motto is “service, service, service” and you will see that from the first contact, quote, fast delivery, and every transaction you have with our friendly and professional customer service team. Let Haulaway be your storage solutions partner, whether you need excess inventory storage for your retail store, temporary holding space for office supplies and furniture during a remodel, or a spot to keep your boat or vehicle. We will work to make sure you receive the storage you need, with the convenience of mobile and temporary locking storage containers. Our industrial storage containers can be used for a wide variety of uses in Seattle. 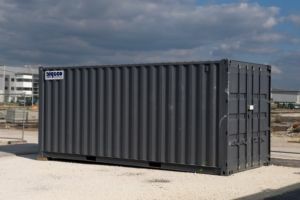 Whether you need product storage in your warehouse or outdoor storage containers for office buildings, construction sites, residential homes, and more, we have the right options for you. With Haulaway, you have an option of five different sized containers, all made with 14-guage steel and water-resistant construction to give you protection from the elements. Our locking storage containers are all well protected with our patented Rhino Locking System which gives you the best possible security for your valuable property, and frees your mind from worry over theft and vandalism. Every container from Haulaway is a top of the line product that offers protection from the weather and theft, convenience of on-site storage, and a portable solution to your storage problems. We offer fast, on-time delivery, and can even deliver most places within one business day. Don’t wait days for another company to respond and set up a time, contact us today to discuss your needs and have industrial storage containers delivered to your site in Seattle tomorrow.